One of the first things people ask us when the topic of our travels comes up is how we can live without a daily or twice-a-day warm shower. It’s strange to imagine for some people, but the reality is that unless you’re running marathons every morning, it really isn’t necessary to shower as frequently as most do and still stay reasonably fresh and clean. Of course we’re not advocating to abandon personal hygiene either. Just because you’re living in a van doesn’t mean you have a free pass to look and smell like a hobo all the time. We’re definitely not the final authority on the matter, but after almost a year on the road with our Delica campervan, four months travelling in South America in our Montero Sport camperwagon, and many previous road trips before that, we have managed to pick up a few handy tips. 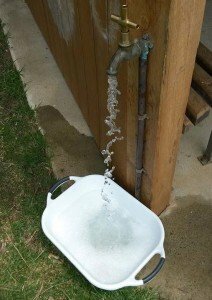 In preparation to spend a week or so free camping, often where there is no source of fresh water, we always fill all our water storage to maximum capacity. 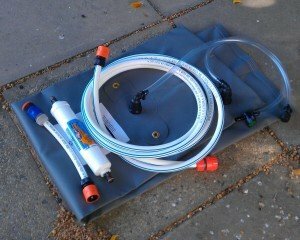 In Australia it is very easy to source fresh, clean town water at no cost. Usually at boat launching areas on the coast, tourist information centres, dumping points, and/or local parks will have a publicly accessible tap. Photo credit: Where’s My Office Now? The solar shower was just an el cheapo we bought from a camping store. It was reasonably effective at heating up the water from just 3-4 hours on sunlight, even on cool days. However the nozzle was a terrible design and difficult to twist off with wet hands (obviously someone wasn’t thinking when they designed it). We fixed this by installing a 2-way adjustable valve with large handle. 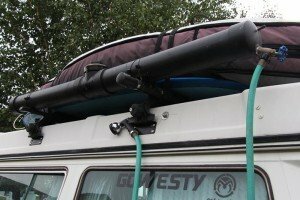 We’ve also seen some folk with PVC pipes mounted on their roof which were painted black (to heat the water) and a tap fitting at the end. We’re not big fans of increasing weight on an already top-heavy vehicle though. Since the main goal of the trip was to chase waves, we thankfully managed to get wet most days. It’s surprising how clean you feel after being immersed and washed around in salty water for a few hours. Plus, most beaches have cold, freshwater showers at the carpark which were great to rinse off afterwards to avoid that sticky salt-encrusted sensation. When you’re on the road any friends, relatives, friends of friends, or friends of relatives are always great to visit. Not only because you get to have a nice warm shower, but also to wash your clothes, charge your devices and leach some WiFi. The 8L basin tub we bought at the start of the trip turned out to be one of the most versatile pieces of equipment we had in the van. We used it to rinse fresh produce, wash dishes, wash clothes, and as a mini bathtub complete with warm water. which allowed access to many taps at recreational reserves and parks which were missing the handle. They are small, light and inexpensive. Note: Usually the handle was removed for a reason. Take only what you need and check that the water is potable before drinking. We didn’t bother with the gym membership as we free camp and are away from urban centres most of the time. If you’re vanlifing it in a city, a gym membership might be worth looking into. Local aquatic/recreation centres generally have hot showers and charge a minimal ‘spectator’ fee if you’re not actually using the pool or main facilities. We were invited to park up at random people’s houses a number of times, usually they were locals in the area that we’d met at the beach and got talking to. Most folk in non-touristy areas are fairly welcoming and accommodating to travellers once they get to know you a little. Obviously it’s always important to practice common sense and avoid putting yourself in a potentially dangerous situation. If it feels wrong, just politely decline and drive away. Wet wipes (aka wet towel or moist towelette) are our cleanliness saviour when we’re on the road. This is especially the case when we are free camping somewhere beautiful with no access to fresh water. It’s amazing how refreshed and clean you feel just by using a couple of these wipes. We always carry a large pack in the van at all times, even when we’re not actively travelling. They are also great for removing residual sunblock and zinc cream. What did we miss? Leave your top tip for maintaining cleanliness while road tripping in the comments below or on our Facebook page.